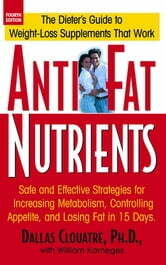 Anti-Fat Nutrients explains how and why the body gains and loses weight, and the critical role fat plays in this process. It explores new directions in the study of weight control, and details the important contributions vitamins, herbs, amino acids, enzymes, and other nutrients can make to dieters' lives. It uses a simple food-based approach to weight loss that can be used in combination with anti-fat supplements to maximise results, or as a template for designing your own anti-fat weight-loss plan.